Drive along Brazil's spectacular Green Coast road, a winding route through coastal mountains and jungle covered slopes. Swim and snorkel off deserted tropical island beaches at the island paradise of Ilha Grande. 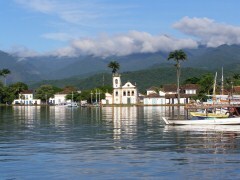 Explore the charming little town of Paraty with its narrow cobbled streets and rustic, whitewashed colonial buildings. Day 1: Transfer from Rio to Angra dos Reis. Ferry to Ilha Grande and transfer to your accommodation. Day 2: Ilha Grande day at leisure. Optional walks and snorkelling. Day 3: Ilha Grande day at leisure. Optional boat trip. Day 4: Ferry from Ilha Grande to Angra dos Reis and transfer to Paraty. 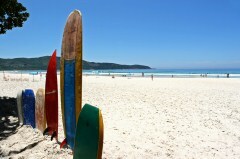 Day 6: Departure transfer from Paraty to Rio hotel or airport or optional transfer to Sao Paulo. Extra time is never wasted time in Ilha Grande. Further explore the inland areas close to Paraty which include some exceptional waterfalls and a Cachaça Distillery. From the airport or your hotel in Rio, you will be met and transferred 2-3 hours to the old port in Angra dos Reis where you will take a two hour ferry journey to Ilha Grande. The scenery in this area is spectacular and gives you time to appreciate the magnificent coastline of Rio de Janeiro State. The ferry arrives at the wonderful Vila do Abrao, the main village of the island, which stretches quietly along the coast. You will then transfer to your hotel on foot, as cars are prohibited on Ilha Grande. The rest of the day is free for you to relax and explore the beautiful beaches close to town. Enjoy a day at leisure to explore the island, one of Brazil’s most well-preserved natural habitats. Trails crisscross the island, winding through pristine jungle, crystal clear waterfalls and deserted beaches such as Lopes Mendes (voted one of the best in Brazil). Ilha Grande is an unspoiled paradise waiting to be explored. After a relaxed breakfast you'll have the option to head out on a boat trip around the island to visit some of its many secluded beaches inaccessible by foot. You'll also have the option of snorkeling amongst the tropical fish, sea turtles and coral of the lagoons, or scuba diving amongst the many wrecks in the open seas. There is rumour of pirate´s treasure buried somewhere near the island, so keep your eyes open. If all this seems like a little too much activity, you are welcome to spend the day relaxing on one of the island's beaches. After breakfast you'll be shown to the small port in town to catch the boat from Ilha Grande back to Angra dos Reis for your one hour trip down the coast to Paraty. After arriving at your hotel in Paraty, you'll have the afternoon and evening to spend at your leisure. In the morning you will start the day with a light walking tour with one of our local guides, making your way through the quaint and colourful streets of Paraty. 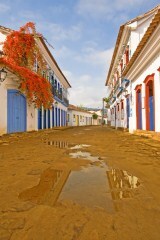 Different from other colonial Brazilian cities, the architecture of Paraty has character and originality. It is also a Historic National Monument and UNESCO listed. As you meander through the cobblestone streets, visiting churches, galleries, museums and houses, you will learn of the legends and history of the town. Enjoy the afternoon at your leisure. After breakfast we transfer you back to Rio (3-4 hours) or if you prefer we can also arrange for you to be transferred to San Paulo airport (4-5 hours). Hotel rates are based on twin share lead in rooms. Other room types and hotels are available. Rates are subject to change and different rates may apply during holiday seasons and special events.